Happy 4th of July week from Karin's Florist! Read more on our Blog. 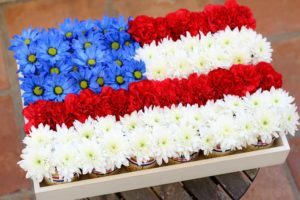 Flowers | Flower Delivery | Send Flowers | Karin's Florist | Our Blog | Blog | Happy 4th of July week! We hope everyone is enjoying the lovely barbecue weather and will have a chance to see 4th of July fireworks with their loved ones. Planning on a picnic? We offer a wide range of snack items perfect for an evening outing at our favorite, Wolf Trap Performing Arts Center. Compliment your gourmet basket with one of our class prosecco, champagnes, or delicious wine, white or red. Enjoy the lawn and bring your own picnic items while enjoying a show of your liking. Get in the summer mood, grab some friends and let Karin’s set up the perfect evening for you! Wish you were at the beach, but won’t be able to make it this summer? With new vases, custom bird painted lamps and unique ocean/beach items, we are sure that you will find something that makes you feel just a little closer to the beach! Have time to read our blogs and enjoy learning new and interesting information? If you have any information you would like us to share about flowers or the floral industry, we always love new input and suggestions! Shoot us a E-mail at Flowers@KarinsFlorist.com for a chance to be apart of our next blog post.